"SapuraCrest Petroleum Bhd executive vice-chairman and president Datuk Seri Shahril Shamsuddin will be group president and chief executive officer (CEO) of the new merged entity between the company and Kencana Petroleum Bhd "
Datuk Mokhzani Mahathir, who is Kencana CEO, will be the enlarged group’s executive vice-chairman, according to letters sent by the former and Shahril to their respective staff. The letters, obtained by Business Times yesterday, also noted that the Securities Commission (SC) had approved the merger proposal a few days ago. Datuk Hamzah Bakar, currently chairman of SapuraCrest, will be nominated group chairman, Shahril said in his letter. “It is critical that we put in place a strong and dynamic organisational structure that would ensure business continuity and realisation of the synergies we hope to derive as a merged entity. “I would like to assure each and everyone of you that you will continue to be an important part of the new organisation. “As founding members of this new organisation, it is incumbent upon all of us to ensure that the organisation continues to grow and chart new territories as a global oil and gas player,” he said. Mokhzani said he and Shahril had come up with a “winning management” formula. “We have decided that we both can lean on each other to strengthen the prospects of two already successful companies. Neither will take a back seat to the other. We will both helm the company and chart its way forward. “With the approval from SC now obtained, the journey towards merging the two companies will really begin in earnest,” Mokhzani added. The RM11.85 billion merger will create the largest oil and gas (O&G) service provider by asset in the country. 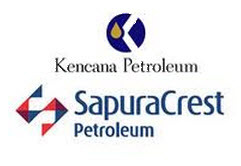 Once completed, the SapuraCrest-Kencana group will be the world’s fifth largest oil and gas service provider. Under their cash and share swap deal, special purpose vehicle Integral Key Sdn Bhd will buy all the assets and liabilities of SapuraCrest for RM5.87 billion and Kencana for RM5.98 billion. Following the SC approval, the next hurdle will be for both companies to secure 75 per cent of shareholders' approval each before the deal can go through. Kencana, meanwhile, has set December 15 for its EGM. Shahril, via Sapura Technology Bhd, owns a 40.1 per cent stake in SapuraCrest, while Mokhzani's investment firm, Khasera Baru Sdn Bhd, owns a 32.4 per cent stake in Kencana. Other key shareholders of Sapura is Norway-based Seadrill Ltd with a 23.6 per cent stake, while Kencana has Kumpulan Persaraan Wang with a 6.8 per cent stake in it. Both Sapura and Kencana have a common shareholder in the Employees Provident Fund with a 10.1 per cent stake and 7.8 per cent stake respectively in the companies.